Ghahvehchi, F. (2013). Meta-cognitive therapy versus cognitive therapy in reducing meta-worry in students with test anxiety. International Journal of Behavioral Sciences, 7(1), 19-26. Fahimeh Ghahvehchi. "Meta-cognitive therapy versus cognitive therapy in reducing meta-worry in students with test anxiety". 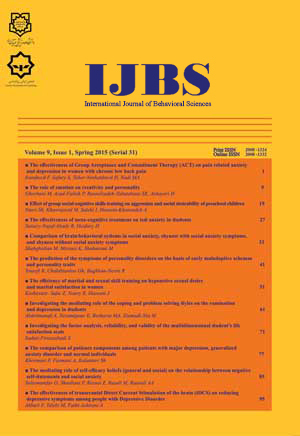 International Journal of Behavioral Sciences, 7, 1, 2013, 19-26. Ghahvehchi, F. (2013). 'Meta-cognitive therapy versus cognitive therapy in reducing meta-worry in students with test anxiety', International Journal of Behavioral Sciences, 7(1), pp. 19-26. Ghahvehchi, F. Meta-cognitive therapy versus cognitive therapy in reducing meta-worry in students with test anxiety. International Journal of Behavioral Sciences, 2013; 7(1): 19-26. Introduction: The present study was an attempt to investigate the effectiveness of meta-cognitive therapy and cognitive therapy in reducing meta-worry in students suffering from test anxiety.Method: It was a quasi-experimental study with pretest-posttest design with a control group. The population of study comprised of every graduate female students in Tarbiat Modares University. They were initially screen using Spielberger anxiety questionnaire, and 15 participants who met exclusion-inclusion criteria were selected and randomly assigned to three groups of meta-cognitive therapy, cognitive therapy, and control group (5 in each group). The experimental groups received 8 sessions of meta-cognition and cognition therapy while the control group did not receive any intervention. Wells’ Anxious Thoughts Inventory was used at pretest and posttest. The obtained data were analyzed using an ANCOVA.Results: A significant difference was observed among the three groups in reducing meta- worry in students. The results showed that meta-cognitive therapy was more effective than cognitive therapy in reducing meta-worry in students with test anxiety. Also, both meta-cognitive and cognitive therapy showed greater reduction in meta-worry than the control group. The results showed that cognitive therapy was more effective than meta-cognitive therapy in reducing social worry and meta-cognitive therapy was more effective than cognitive therapy in reducing worry about health.Conclusion: Considering the advantage of meta-cognitive therapy over cognitive therapy in reducing meta-worry, it is recommended that therapists use this method in reducing meta-worry in individuals.